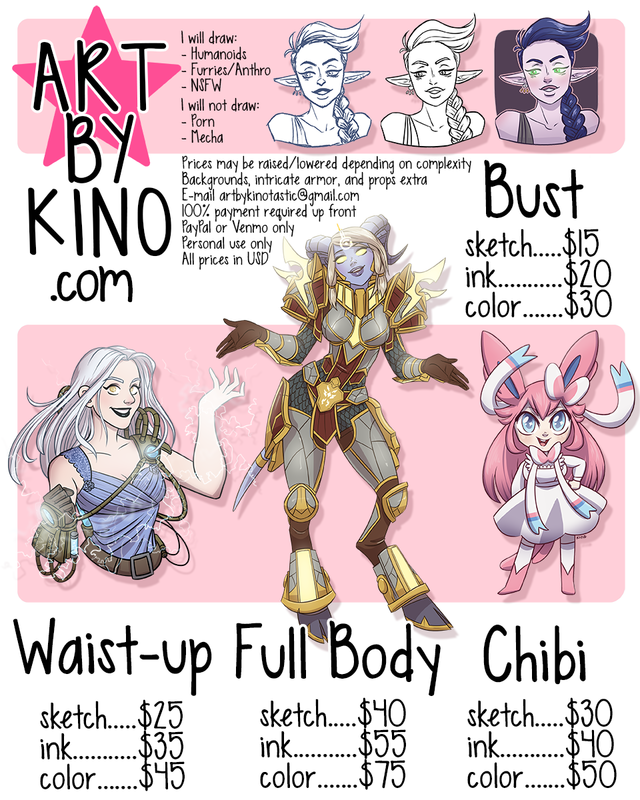 Send me an e-mail to artbykinotastic@gmail.com with a description of your character and any reference pictures you may have. If you’ve given me sufficient information, and if what you requested is something I can do, I will contact you with an estimate. After a price is agreed upon, send your full payment to Venmo (@ArtByKino) or I will send you an invoice. I will not start your commission until full payment has been received. Only minor revisions will be allowed after the sketch has been sent to you for review. Check out my current queue on Trello! Art may not be resold. If no reference pictures are provided or if I have to design the character based on a description alone, there might be an additional cost. If the desired character you’d like to be drawn is wearing intricate or otherwise complicated pieces of armor or equipment, an extra amount will be added in addition to the base cost because of the further time and effort required on my part. The amount will depend on the piece; for example, a full-body character in full armor with a simple background will cost an upwards of $100+ depending on complexity. Thanks for reading! I look forward to working with you!